Page Updated:- Wednesday, 02 January, 2019. Above photo 1952. Creative Commons Licence. Above photo, 1953, kindly sent by Rory Kehoe. 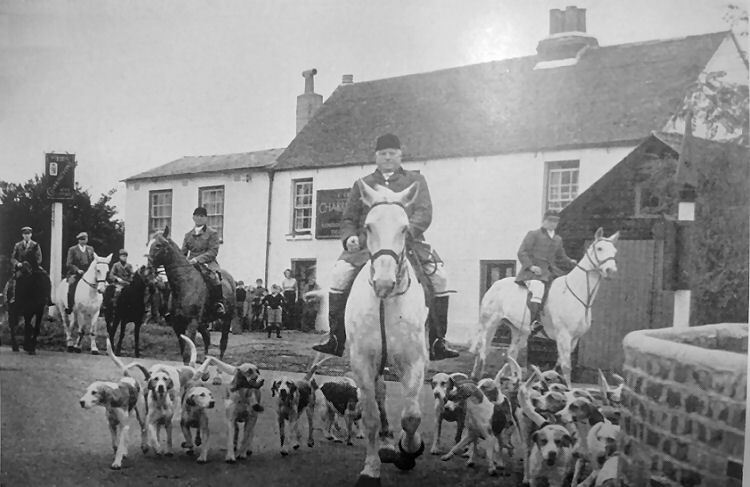 Showing Mr. "Nipper" Stevens, Master of the West Street Hunt, leading runners and riders into the field. 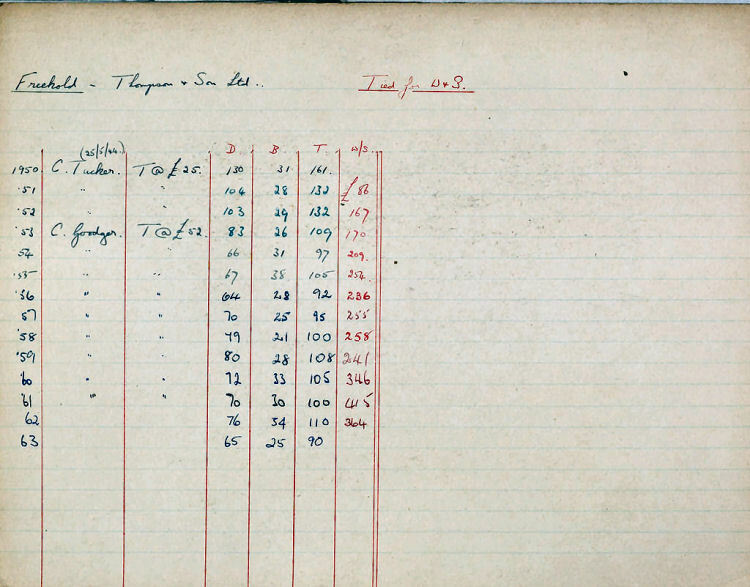 Thompson & Son ledger. Creative Commons Licence. Above photos taken by Paul Skelton, September 17, 2011. Photo above is of the St. Crispin in Worth, date unknown. By kind permission of the St. Crispin from a painting of 1992. Above picture by kind permission of the "St. Crispin," date unknown. Taken from a card issued by the pub, date unknown. One of the original tied houses of Thompson and Sons brewery at Walmer. Legend has it, that the St. Crispin is so named due to Henry V landing very close to Worth, after stuffing the French at Agincourt and one of his soldiers falling for the charms of a local alewife. They lived together for a while at the local inn and it was named in honour of St. Crispin, as it was on his feast day (25th October) in 1415 that King Henry's army soundly defeated the French. Henry's army was supplied with locally brewed beer from the Deal and Walmer area, under the terms of the Confederation of the Cinque Ports. 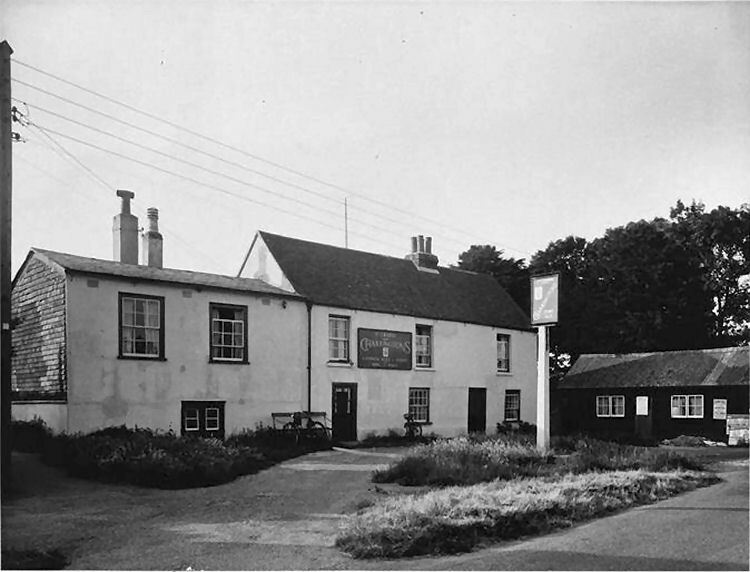 This pub was sold along with another 11 public houses in neighbouring villages in 1826. The sum was £625 for this house but it is not known from who or to whom. Situate and being in the upper half hundred of Eastry lathe of St Augustine, lies the parish of Worth, written in Saxon text as Wealth, then later word, or occasionally Woad. 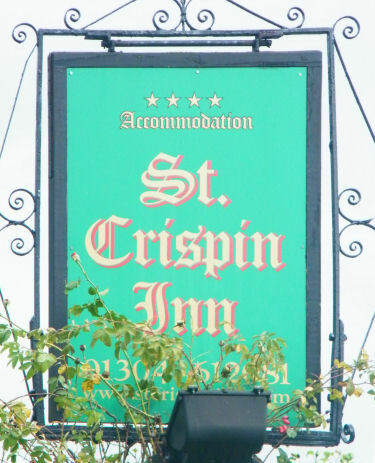 There within the parish boundaries can be found the St Crispin Inn. This tenement was built during the reign of Henry V (1413-1422) in the year 1420. It was originally a farmhouse forming part of the estate of the Nebynson family of Eastry, who came to settle there during the reign of Edward III (1327-1377). It was here that the Reeve lived. The Reeve was the overseer or foreman who acted for the Lord of the Manor. The earliest recorded occupant of the house is one Nathaniel Foysters, overseer and farmer who resided here in 1493. For most of the sixteenth century the house was occupied by tenant farmers bound to the estate of Nebynson. In 1625 the property was split from the estate and sold with 7 acres of arable land to one Clement Gardner, farmer and shipping agent, formerly of Sandwich. He resided in and owned the property until his death here in 1653, after which it was transferred by right of descendancy to his nephew Avery Gardner, malt and hop brewer of Dover. In 1668 he sold the property to his brother Amos, also a brewer of Dover, for 175 guineas. Included in the sale inventory was a "brewehouse, 5 wassails (drinking mugs) a mare, harness and saddle, and 15 chickens". Amos Gardner held the property until 1682 whereupon he sold it to one Abraham Skulley, brewer and common beer-seller of Sandwich. In 1690 he was granted a common ale and cider licence and the house became a registered but untitled ale house. 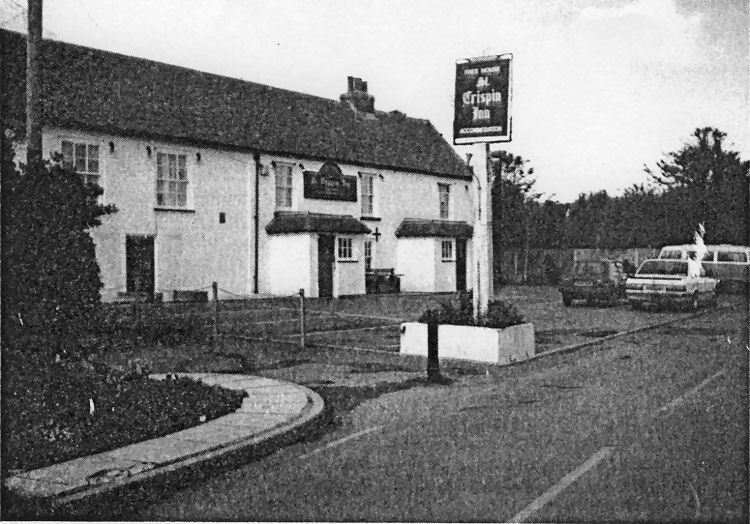 In 1712 he sold a now flourishing ale establishment to one Michael Ambrose, shoemaker and beer seller of Goddington, near the town of Ashford. The family of Ambrose were for many years shoe-makers at Ashford, so in keeping with tradition, Michael Ambrose called the house "The Crispin", after Saint Crispin and Saint Crispinian, who were the patron saints of shoemakers. He registered the house under this title and, for some reason, omitted the word 'Saint'. This was not added until 1906 when one Edward Minter became keeper. In 1767 Joshua Hawkins, keeper of this inn for twenty three years, died. In his last will and testament he bequeathed the inn, all his chattels and belongings to his wife Fanny, on condition that she remain a widow for the rest of her nature life, never remarrying and therefore remaining faithful to the spirit of her dead husband. This was a strange request for, when he died, Joshua Hawkins was 74 years old and his wife 73. She remained a widow and died here in 1772. Worth, though only a small parish, extended then as far as the coast line - notorious for smugglers, who were known to have used the Crispin. Reward posters were often hung in the inn as a deterrent against those committing the offences or as an incentive for those who wished to inform. In 1790, the Crispin became the post house where the mail was collected and sorted and quite often the task of delivering fell upon the shoulders of the resident keeper, a tradition that lasted well into the nineteenth century. Inquests on bodies washed ashore were held here throughout the nineteenth century. In 1857, a collision occurred between a barge and a sailing ship, resulting in the loss of sixteen lives. Each one of the corpses was carried on the shoulders of men from the beach to a lodge at the rear of the inn, to await the coroner. From 1850 until the turn of the twentieth century, innkeepers from other inns and taverns would hold meetings here. They came to discuss business and collect their spirits, for during this period the Crispin was the spirit wholesalers. A business set up by one Charles Lepine in 1850. Lepine was for many years the post master of the parish. The St Crispin has seen many changes since first it was built, but its character remains unchanged. So, stay, enjoy the fayre and reflect on those bygone days. Sussex Advertiser 20 February 1826. The "Bull," at Eastry, £1,190. "Rose and Crown," Womenswould, £166. "Duke of Cumberland," Barham, £910. "Red Lion," St. Peters, £1,100. "Crown and Thistle," St. Peters, £705. "Crown, or Halfway-house," Sarr, £940. 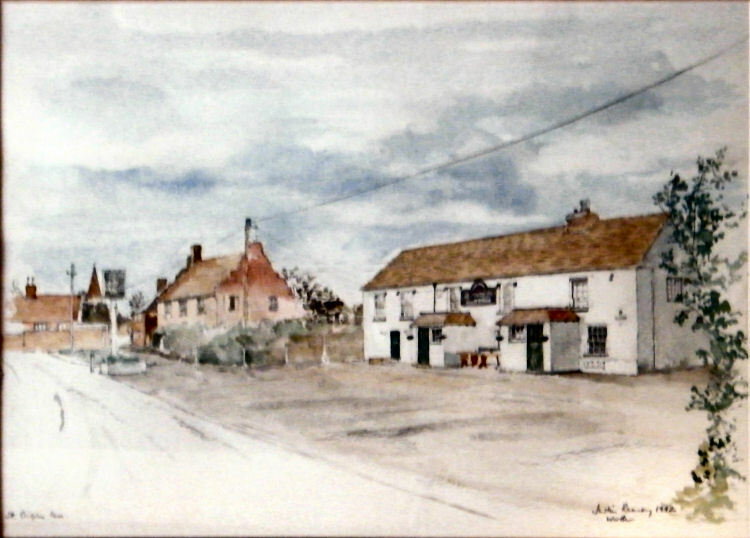 "King's Head," Walmer Road, £425. The "Duke of York," Walmer Road, £310. The sale-room was most numerously attended. We understand that the "Ship," at Ash, and "Crispin," at Worth, have since been sold by private contract, the former for £750, and the latter for five hundred guineas. From an email received 28 November 2018. My great (x3) grandfather James Durban (1769-1848) was landlord at the "Crispin Inn" at least from 1841 (census) until 1847 (Bagshaw Directory). Do you have any more information about the pub or him around this time? His gravestone is in St Peter St Paul Church Worth. 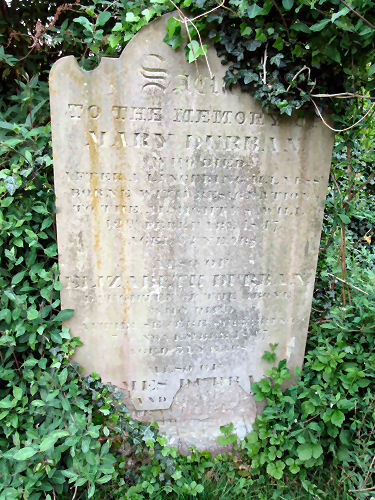 TO THE MEMORY OF MARY DURBAN WHO DIED AFTER LINGERING ILLNESS. BORNE WITH RESIGNATION TO THE ALMIGHTY'S WILL 12TH FEBRUARY 1847 AGED 62 YEARS. HUSBAND OF ABOVE FEBRUARY 1848 AGED 79 YEARS. From the Kentish Chronicle, 20 February, 1864. On Monday Mr. Callaway, deputy coroner, held an inquest at the “Crispin Inn,” Word, on the body of a male child which had been discovered on the sea shore, near No. 2 Battery. William Frost, of Deal said that about eight o’clock on Saturday morning, near No. 2 Battery, he discovered the body of the deceased child floating on the water. He and another boy got out and informed the Coast Guard. John Hopkins, Coast Guardsman, deposed to seeing the boys body out of the water. Dr. Emmerson, of Sandwich stated that he had examined the body, which was that of a full grown healthy looking male child. There were no external marks of violence on the body, which had not been in the water long, but it might have been dead before being put in. From the Deal, Walmer, and Sandwich Mercury, 29 May, 1869. 1d. Begs to announce that he has taken the above Old-established INN and trusts by attending assiduously to the comfort of his guests, and keeping a first-class article always in stock, to receive a share of public support. Good accommodation for TEA PARTIES, Bowling-green, Stabling, &c., &c.
From the Deal, Walmer, and Sandwich Mercury, 24 March, 1900. John William Hinchcliffe and Robert Atkinson were charged with assaulting William Ward, landlord of the "Crispin," Worth, on the previous day. The prosecutor said the two men had been working at Worth for the last week. He returned home about 5 p.m. the previous day and found them at his house. They were served with beer in the tap-room. Witness went to his tea and afterwards returned to the tap-room, as the men were using bad language. He remonstrated with them, and Atkinson then threatened him and wanted him to fight. He continued to use bad language, and prosecutor took hold of him and put him out of the door. The man then turned and tried to strike him. Hinchcliffe also left and both returned and burst open the door. Atkinson again struck out at him and Hinchliffe encouraged him, and eventually the latter took up a pint glass and threw it at prosecutor, striking him on the head. He received wounds in five places, and had to be attended by Dr. Chidley. William Michelthwaite corroborated the prosecutor's evidence. He said when the latter returned to the tap-room the men asked for more beer and the landlord refused to serve them, and as they continued to use the same filthy language Mr. Ward put Atkinson outside. The prosecutor then bolted the door and the men kicked it and burst it open. They came inside and Atkinson again struck Mr. Ward and Hinchcliffe threw a pint glass at him. The glass caught a slanting piece of partition and broke, the pieces striking the landlord's head. The latter was led to the kitchen, and witness bathed his head. The Magistrates sentenced each to 14 days with hard labour. From the Dover Express and East Kent News, Friday, 4 November, 1910. Mr. A. M. White, of the "Crispin," Worth, applied for an extension from 10 to 12 p.m. on the 17th inst, on the occasion of the annual dinner of the Horticultural Society. - Granted. Dover Express 19th July 1918. A meeting of the Eastry Rural District Tribunal was held on Wednesday when there were present Mr. G. O. Elliot (Chairman), Messrs. W. G. Chandler, F. S. Cloke, A. E. Kennedy (National Service Representative), Mr. H. Capeling (Representative of Board of Agriculture) and Mr. F. A. Cloke (clerk). 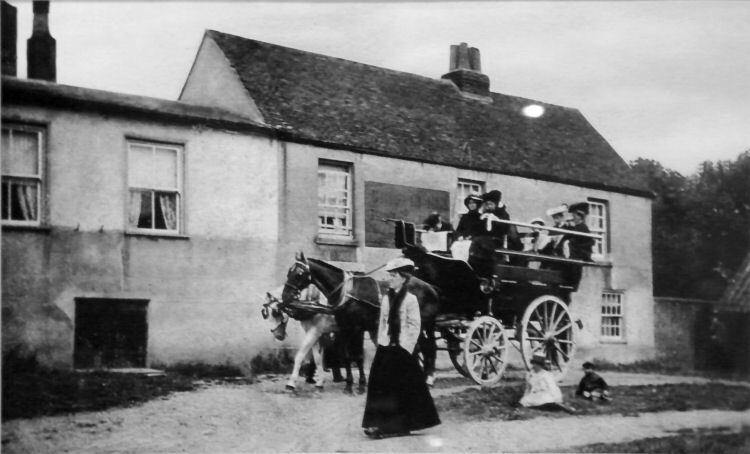 F. T. Excell, aged 47, Grade 11, married, licensed victualler, to do harvest work last two weeks in August and first two weeks in September and afterwards two days a week in agriculture, excused volunteers. From the Dover Express and East Kent News, Friday, 7 September, 1923. Price 1½d. 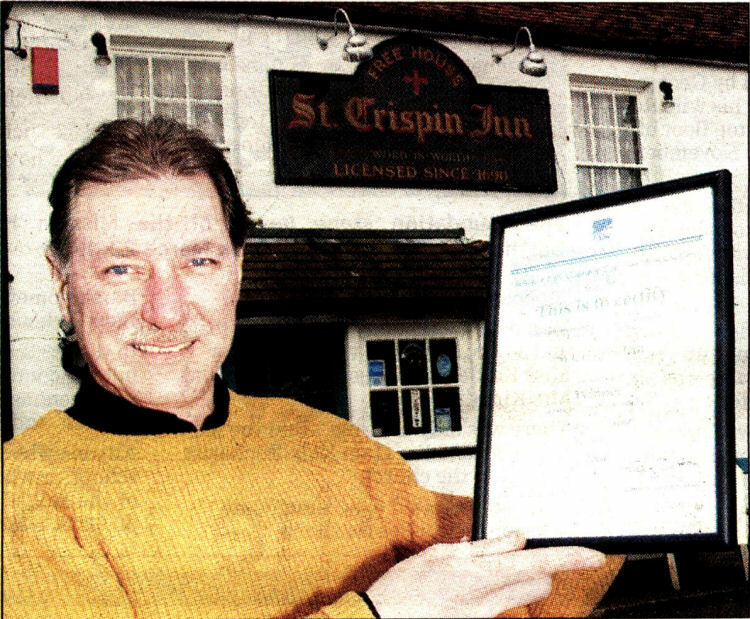 The licensee of the "St. Crispin," Worth, was granted an extension for a harvest supper on September 20th. 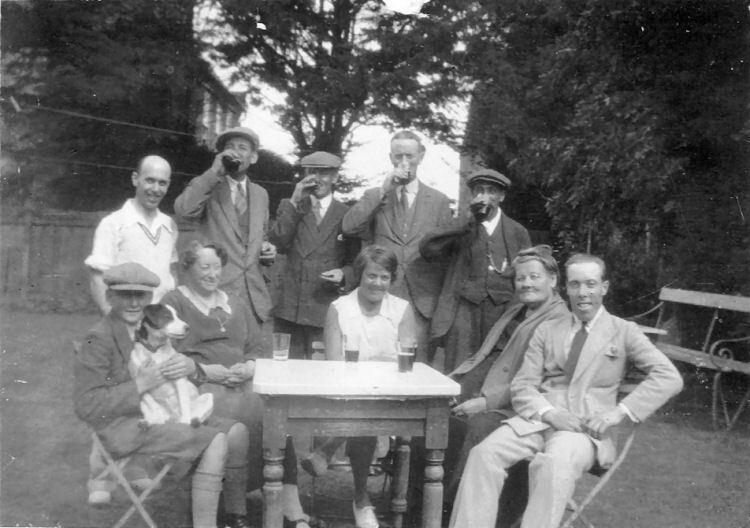 The following four photographs have kindly been sent by Chris Excel, who says they are his ancestors and friends enjoying Thompson Walmer Ales at the St. Crispin at Worth in the 1930s. From an email received 16 July 2014. As far as I know the Solly family and the Solley family famed for their dairies were not related. I was interested to see the name Mary Elizabeth Solly as I thought her name was Elizabeth, (I only knew her as Granny). All the postcards and envelopes addressed to her that I have from her maiden days were addressed to Elizabeth Pilcher. 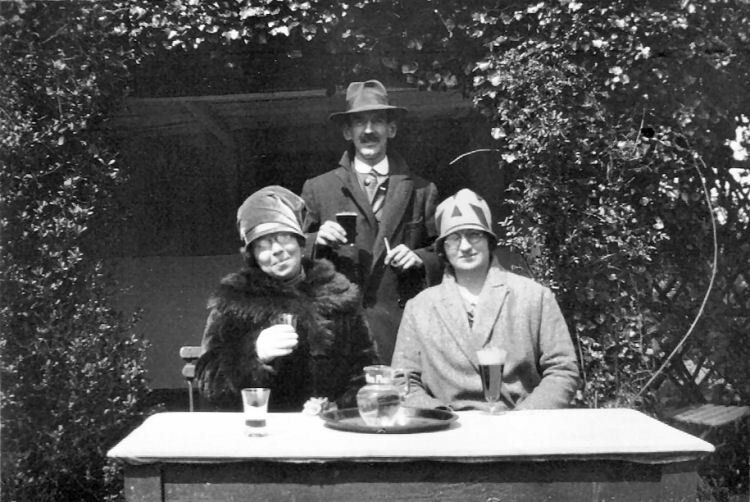 Frederick Thomas Excell died of cancer and his wife ran the pub on her own for about a year, at that time breweries did not allow widows to carry on for more than a year, I think the term used was something like the Widows Grace. 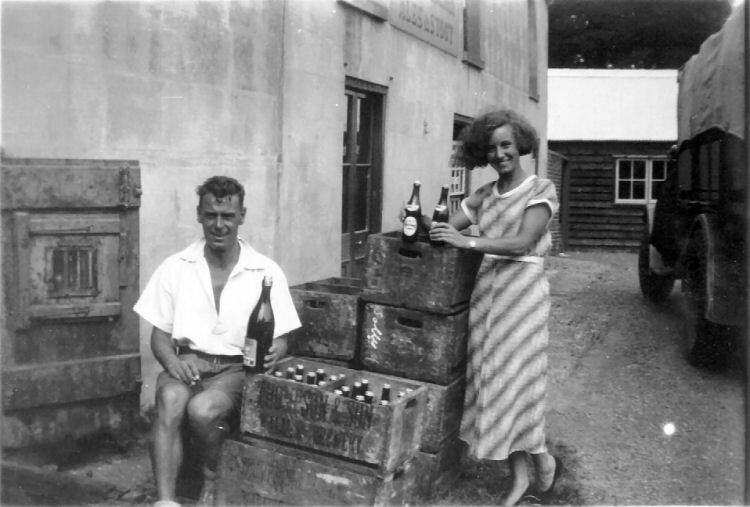 She married Douglas Solly and continued at the pub but I think the licence was then in the name of Douglas Solly. For interest I attach a picture of the tombstone of Frederick Thomas Excell which is at Worth Church, and a newspaper cutting of the obituary of Douglas Solly. I don't think the Excell's could have had much money because it was the customers who paid for the tombstone that is pictured. Mr. Douglas Solly, of 32 Laburnum Avenue, Sandwich, died in Faversham Hospital, aged 78, exactly eight weeks after the death of his elder brother, mr. R. H. Solly, of Mill Wall Place, Sandwich. Born in Sandwich, Douglas Solly was in his youth a very useful cricketer and was a keen member of the old Sandwich Cricket Club in 1905. 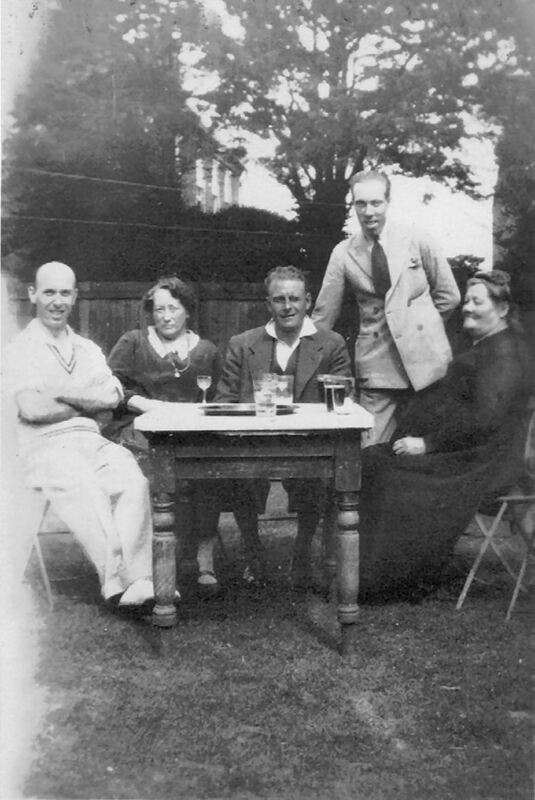 About 1907 he entered the accounts office of messrs. Warboys' Brewery in Cambridge, of which his cousin, the late Mr. T. S. Colman, of Ash, was a director. As a change from his sedentary occupation his hobbies were helping to train greyhounds for coursing matches and visiting Newmarket to watch the training of potential winners of the derby and other horse races and passing on useful "tips" to friends! At the outbreak of the 1914-18 War he joined the Royal Army Service Corps and was placed in mechanised section as he was already an experienced motor driver with a good technical knowledge of the inner working of cars. He served in France for over four years, driving the heave lorries containing either food supplies or ammunition up to the firing line. In 1920 with his war-gratitude he bought a fairly large fruit plantation at Worth. For some years he worked at this successfully, but eventually on medical advice he had, reluctantly, to relinquish it. Like so many lorry-drivers of World War 1 who went for days and nights without sleep, particularly during 1918 spring when the Allies were nearly defeated, his health suffered as the years went by. 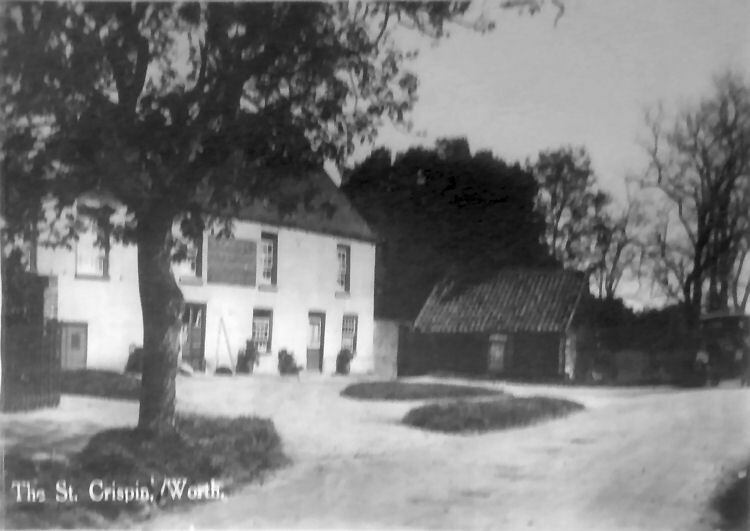 After selling the fruit plantation he became, for some years, "mine host" of the old "St Crispin Inn" at Worth. Later he lived in London and Sussex before returning to his home town permanently. He was a widower with no family. Behind his quiet reserved manner was a lot of good-nature and a keen sense of humour. he had many friends in the district. The cremation service at Barham was conducted by the Rev. Canon R. O. Clark, R.D. Mourners, Mr. and Mrs. R. Solly (brother and sister-in-law). Miss Maxton (niece) Mr. and Mrs. G. Excel, Mrs. F. Excel (also representing Mr. F. Excel). Floral tributes were from: Bob and Dickie; Margaret, Lorna and Hazel; Meg; Ted, Mary and Bill; Mrs. Marsh, George and Rose; Fred and Kitty. Mr. E. W. Solly (brother) and Mr. and Mrs. W. Sage (nephew and niece) were unable to attend. From the Dover Express, Thursday 10 February, 2005. The ancient inn of St. Crispin at Worth, near Deal, has won the annual competition to find the best pub for tourists in the Dover district. The result of the competition, run by the White Cliffs Country Tourism Association, were announced this week. St. Crispin Inn has recently changed hands, but when the association's team of judges secretly visited Jane and Terry O'Brien were in charge. Two months ago plumber and heating engineer Tyrone Mayes acquired the lease of the pub. The building is owned by Enterprise Inns. Mr. Mayes, who continues to work as a plumber, said: "I had been drinking as a customer at St. Crispin for 20 years." He liked the place so much he bought the lease. The attractive property, once a farmhouse, was built in 1420 and is believed to be haunted. 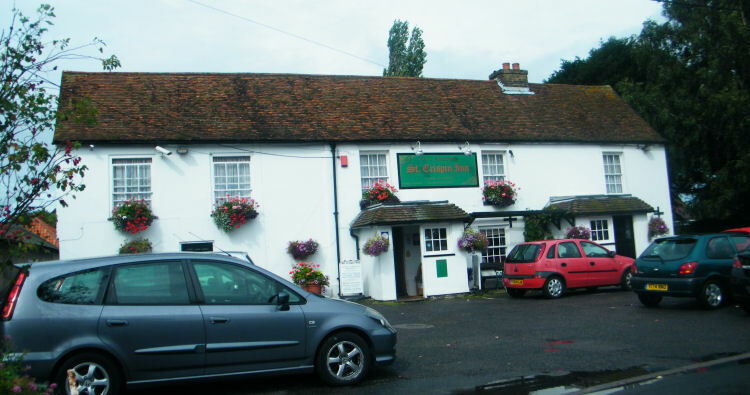 In joint second place in the competition were the "King's Head" in Beach Street, Deal, and the "Crown Inn" at Finglesham. About 20 pubs were nominated by customers and were visited by association judges. From the Dover Mercury, Thursday 17 February, 2005. THE ancient inn of St Crispin at Worth has won the annual competition to find the best pub for tourists in the Dover district. In a secret visit, the White Cliffs Country Tourism Association judges agreed it was the finest in the area. St Crispin Inn, which is also a restaurant, has changed hands and when the WCCTA team visited the public house Jane and Terry O'Brien were in charge. But plumber and heating engineer Tyrone Mayes bought the 21-year lease of the pub. The building is owned by Enterprise Inns. Mr Mayes, who continues to work as a plumber, said: "I had been drinking as a customer at St Crispin for some 20 years." He liked the place so much he acquired the lease. The property, once a farmhouse, was built in 1420 and some say it is haunted. In joint second place in the competition were the King's Head in Beach Street, Deal, and The Crown Inn at Finglesham. About 20 pubs were nominated by customers and were visited by the WCCTA judges. 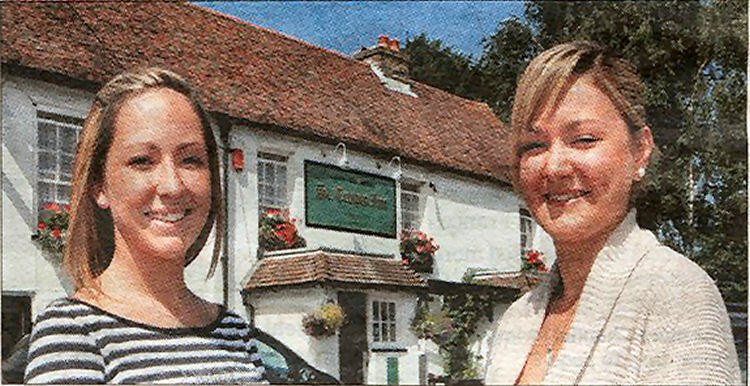 FAMILY BUSINESS: sisters Siobhan and Chantal Heard at the "St Crispin Inn" in Worth. 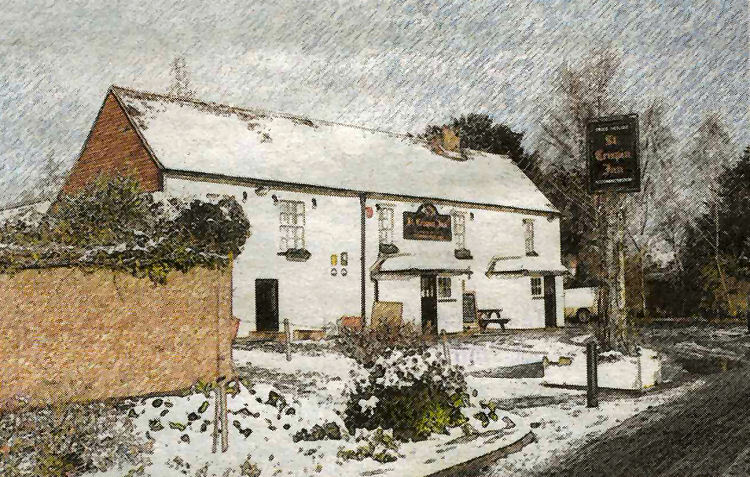 The "St Crispin Inn" the beautiful traditional 15th century pub in the village of Worth, is now under new ownership. Mike Heard always liked the public house in The Street and has lived in and been associated with the community for more than 25 years. So with a long-time ambition to buy an inn to run as a family business, his dream has now come true, with a little help from daughters Siobhan and Chantal. Siobhan said: "I am managing the "St Crispin" and my younger sister works at the pub too, so this is very much family run. The "St Crispin" is on the edge of the village, with plenty of parking at the front and back, a large garden, as well as six en suite bed and breakfast rooms. It is also the ideal place for a wedding or function, with a big marquee in the garden that can cater for up to 100 people. Since the family took ever at the end of June it has already successfully hosted three marriages as well as a 30th birthday perty. Siobhan has worked in pubs before so has a wealth of knowledge about the trade. She said: "Running the business is a new and exciting venture for me, we want to promote the "St Crispin" as a top venue for weddings and all sorts of functions. "We have just introduced a new a la carte menu for evening meals. We have an impressive bar menu for lunch times and we also do special senior citizens, meals. "We only serve the best local produce which is all home-cooked. On the real ale front we promise at least three different guest ales too." The family has lots of plans for the "St Crispin" and lots of ideas for its future. From the EKM Christmas suppliment 2013. A roaring log fire, 15th century beams and a cosy atmosphere all make the St Crispin Inn a special place to be to enjoy a delicious Christmas meal. Bookings are being taken now at the Worth public house in The Street, a family-run business which can offer a variety of ways to celebrate the run-up to December 25. “There is also a separate restaurant serving up to 25, as well as lots of room in the bar and space for 30 diners in the conservatory. The Christmas menu has an option of five starters to suit every taste and there are four main courses. Apart from the traditional turkey served with all the trimmings, including chestnut stuffing, there is also topside of beef with homemade Yorkshire pudding, a pan fried salmon fillet served with a dill and white wine sauce, or roasted red pepper stuffed with spicy vegetable couscous. All four are served with roast potatoes and winter vegetables. Home-made desserts all look tempting, from the traditional Christmas pudding served with brandy cream to cheesecake, gateaux, fresh fruit salad or hearty apple pie. All are served with a choice of cream, vanilla ice cream or custard. An ideal option for villagers and walkers to gain a dose of fresh air. Apart from preparations Feel cosy for Christmas, the pub also and festive geared up to cater for wedding at the St receptions, parties and Crispin Inn other celebrations. 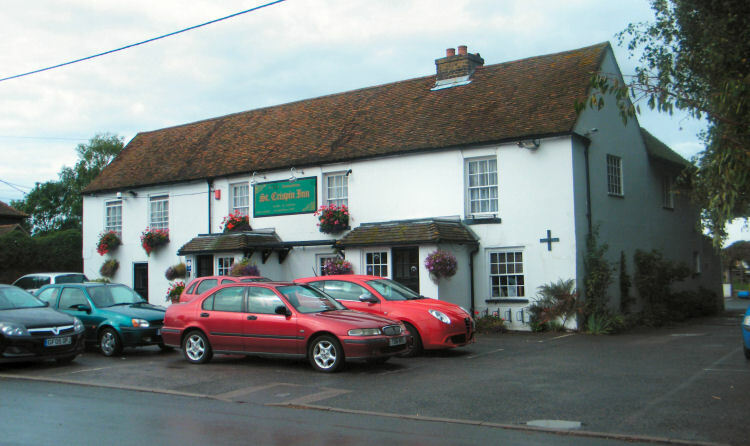 I am informed in January 2015 that the pub is temporarily closed and is up for sale. Opened again under new licensee in March 2015. From the Dover Mercury, 19 November, 2015. By Colin Varrall. Inn that (might have) made home for Henry V.
Local legend had claimed for many years that when Henry V returned from his St Crispin’s Day victory at Agincourt, he disembarked at Worth and it was there that he met and fell in love with a village ale wife. It was believed that the two of them lived together for a time at the local inn, which was the St Crispin. However, a further version of the same story names one of Henry V’s courtiers, rather than Henry V himself, as the beau of the ale-wife. The tenement for the property that is now called the St Crispin public house is believed to have been built in 1420 during the reign of Henry V (1413-1422). Having originally been one of several farmhouses in the centre of the village, it formed part of the estate of the Nebynson family of Eastry, who settled there during the reign of Edward III (1327-1377). The property was lived in by the lord of the manor and the earliest occupant of the house is recorded as Nathaniel Foysters, who resided there in 1493. In 1625 the property was split from the estate and sold with seven acres of arable land to Clement Gardner, a farmer and shipping agent from Sandwich. He lived in and owned the property until his death in 1653. In 1668, the property was sold to a brewer in Dover, including brewhouse, five wassails (drinking mugs), a mare, harness and saddle and 15 chickens. In 1690 the owner of the property was granted a common ale and cider licence and the house became a registered but untitled ale house. By 1712 it had become an ale establishment and it became known as The Crispin, after Saint Crispin and Saint Crispinian, who were the patron saints of shoemakers. The word ‘Saint’ was not added to the name of the property until 1906, when Edward Minter became keeper. In 1790, the Crispin became the post house where the mail was collected and sorted. 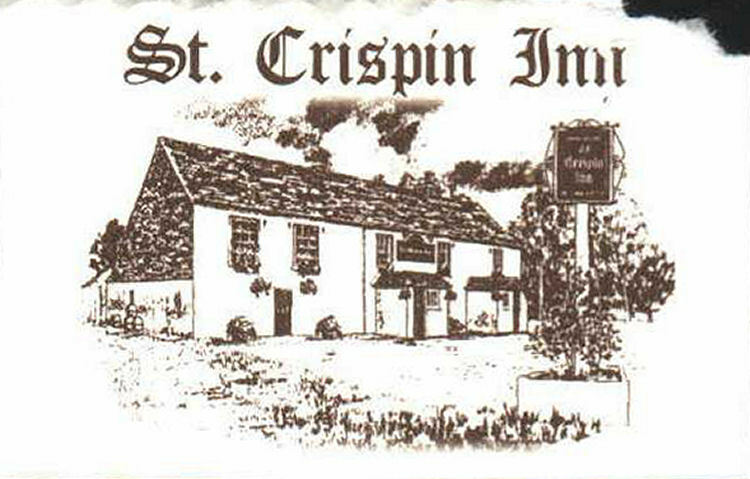 In more recent years, the St Crispin has continued trading as an inn. Food is an important part of the business and a dining room has been furnished. It is also a popular wedding venue. 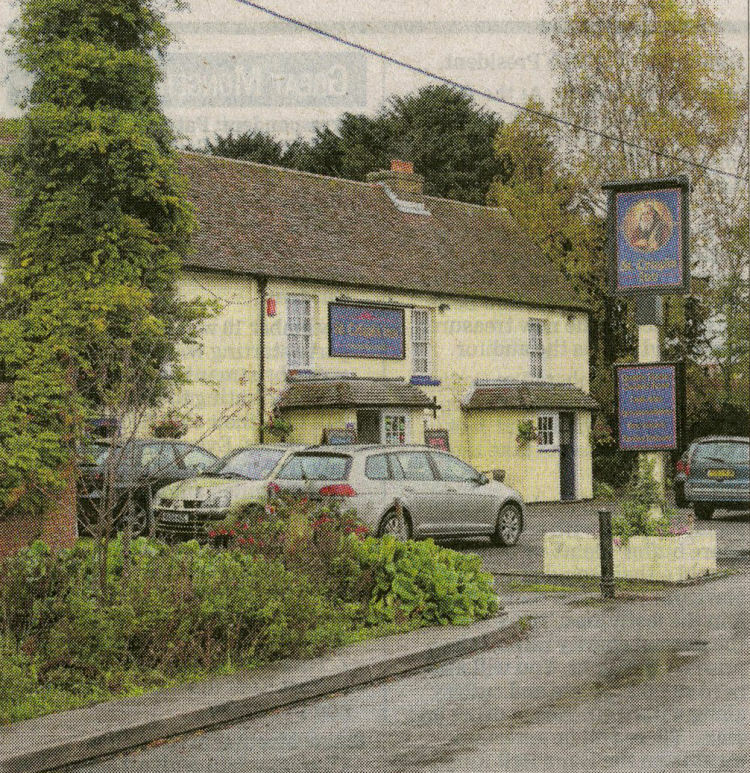 It is owned by Enterprise Inns and in February this year lessees Jason Blown and Peter Walford took over.